The information below was compiled in 2008, early in my exploration of wind farm noise issues. Since then, as I've learned more and come to appreciate the nuances of both what we understand and what is still unclear regarding the effect of wind farm noise, AEI has continued to produce further reports, summaries, and contributions to the trade press. All this material is compiled at the link above; I heartily recommend you look that over, and don't rely solely on the information below. In particular, AEI has produced two comprehensive annual reports on the issue, the first published in early 2010, and the second in mid-2011. These two reports and the information below include complementary information; each focused on different details and aspects of the issue, and over time, the nuances become more clear. Wind energy has long been a favorite of many environmental advocates. No carbon emissions, utilizing a free resource without depleting it in the least, even the potential for distributed generation rather than distant centralized power plants: for many of us, wind was the cleanest of green power sources in our dreams of the energy future. In recent years, as wind turbines have grown from the small backyard kits that the truly committed built in the 70's, the reality has made those dreams become less certain. Modern wind turbines are massive structures, hundreds of feet tall, and often constructed in large wind farms that in effect industrialize rural landscapes, from the rolling grassy hills of California, to the vast rangeland of Texas, to ancient ridgelines in the Appalachians, to the commons in rural England. While the trade-offs may be worth it in some areas, the downsides have become more apparent. Resistance to wind farms is often belittled as NIMBY-ism (Not In My Backyard); but at the same time, proponents often slip into oversimplifeid WARYDU rhetoric (We Are Right; You Don't Understand). In most cases, industrial wind farms are complying with local noise limits; the issue has become whether these noise limits are sufficient to protect rural residents from irrevocable changes in the soundscapes of their homes and farms. If we are to forge a reliable energy future that is respectful of both the environment and the rights of neighbors, we'll need to move past knee-jerk reactions on both sides, and develop best practices that can ensure that the landscape and local residents don't become long-term casualties of today's "Klondike Wind Rush." This AEI Spotlight Report will focus specifically on the noise impacts of wind turbines and wind farms. However, it is worth mentioning some of the other concerns that rural residents have raised about the sudden appearance of industrial wind farms in their communities. Besides the visual impact, which many residents are, in the end, willing to accept as a tradeoff for producing clean energy, the most common argument against wind energy is that wind farms are notoriously inefficient, rarely achieving even half their rated capacity, due to fluctuating winds. Some claim that this means back-up power sources would need to be built, but wind proponents point out that future "back up" energy sources can be the traditional power sources already in place, and industry reports suggest the grid could accomodate up to 20-25% of total power coming from wind, using current installed traditional capacity as needed during low wind conditions. A more important long-term issue, still flying mostly under the radar, is that lease agreements between land owners and power companies can be full of holes, raising the very real specter of ridge lines and rangelands becoming, over time, abandoned junkyards of massive metal hulks, rusting and disintegrating for decades. In addition, bird and bat kills concern many people; while far more birds are killed by animals and windows (a billion per year each in the US), wind farm kills of 100,000-300,000 birds per year are concentrated in particular locations, where the impact may be significant. For some fairly recent assessments of bird kill information, see this article and this presentation. 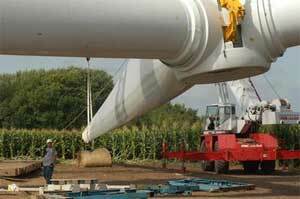 How big are modern wind turbines? 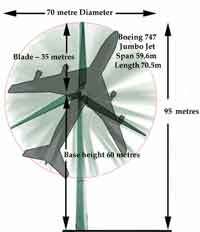 The ones on the left are 60m and 125m; the one on the right is 95m, with blades sweeping an area the size of a 747. It is entirely possible that ongoing technical innovation, combined with closer legal scrutiny, can overcome these issues. Similarly, noise impacts are not necessarily deal-killers for wind energy, as long as developers are honest about what is likely to be heard and continue to work diligently to investigate the aspects of wind turbine noise that are still not fully understood. Continually improving turbine design will likely mean that tomorrow's turbines are not as noisy as today's. Local residents should be sure that their fears are not based on others' experiences with older turbines, and wind energy advocates must be diligent in not glossing over potential noise impacts. With continual incorporation of best technology and best practices in siting, wind energy need not be stymied by noise issues. However, with noise impacts gaining more public credence, it is clear that the current boom in wind farm development could well backfire, for both the industry and a clean energy future, if the current generation turbines are sited too close to residences. The Altamont Wind Farm in California, shortsightedly built on a major raptor flyway in the early years of industrial wind development, has rippled through the years as a poster child for the bird-killing power of wind turbines, despite widespread understanding that it was an exceedingly bad siting decision. Similarly, many noise complaints today seem to be coming from people whose homes are on the near edge of fairly lax siting guidelines (within 500 meters in many cases, and often much less). As you'll read below, it appears that noise can be a significant issue in at least some situations when turbines are within about a half mile of homes (roughly 800m), with some impacts apparent up to a mile away. Some acousticians and health professionals are encouraging setbacks of as much a 1.5 miles (just over 2km). 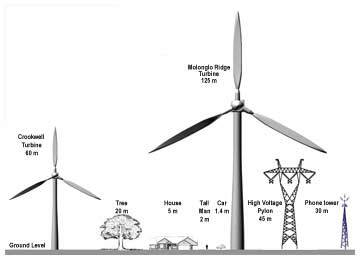 In the US, it is quite common to have setbacks defined as a multiple of turbine height; for example, 5 times the turbine height from a home (which would equate to 500m for a 100m turbine); 1000 feet is also a fairly common requirement. It appears to AEI that a half-mile (2600 feet/800m) setback is appropriate if the goal is to minimize impacts on residents, with a one-mile (1.5km) setback offering near assurance of avoiding noise issues. If the thousands of windfarms likely to be built in the coming decade are placed too close to homes, the industry will be faced with an echoing chorus of complaints and resistance for years to come, even if it manages to invent much quieter machines. Better to be conservative, accepting the fact that even occasional atmospheric effects should be factored in to siting decisions today, so as to build a reservoir of good will, rather than a rising tide of complaints. A key point is made in a study completed in 2007 by the National Research Council, the research arm of the National Academy of Sciences, which found conflicts are widespread because of a fundamental reality of wind power. The environmental costs—visual impacts, noise, landscape and wildlife disturbances—are primarily felt by those near the wind farm. The benefits, however (reduced global warming emissions and other air pollution, less dependence on foreign oil and less mining and drilling) are felt more on the regional or national scale. "Benefits and (costs) don't necessarily affect the same people," said David Policansky, who directed the study. "If you talk to a national representative of an environmental organization, it's quite likely that person will be in favor. Whereas, when you talk to a local representative, it is more likely that person will be opposed to some local project." Likewise, local reactions vary widely. In most cases, locals predominantly favor wind development, because they support green energy or appreciate the additional revenue that turbine leases provide, and a 2005 report from the UK found that local attitudes are more favorable in areas with existing wind farms than in areas with proposed wind farms, with those within 5km actually more favorable than those at greater distances (though the study did not break out those living very close, e.g., under 1.5km). Dueling reactions among nearby neighbors are also common, with some driven to distraction by noise, and others saying it's no problem; however, reports of such disparate reactions virtually never note whether the parties live upwind or downwind of turbines; living closely upwind of a turbine is likely to be much more tolerable than living more distantly downwind, as illustrated by the "wind roses," below. This AEI Special Report is designed to provide a layman's introduction to the types of noise produced by wind turbines. It is not our intention to over-emphasize noise complaints, but rather to provide information that can foster informed conversation about any specific wind farm proposal. A recent UK government survey suggests that about 20% of wind farms tend to generate noise complaints, with half of these considered clearly noise-generated (the other half are considered to be primarily visual issues with noise as a secondary concern); the question is, what are the factors in those wind farms that may be problematic, and how can we avoid replicating these situations elsewhere? NOTE: This AEI Special Report will be periodicaly updated, incorporating new research, more recent reports, and suggestions/comments from readers. Several topics will be added over time, including: effects of noise on wildlife and habitat, offshore wind energy, and the health effects of chronic noise exposure. By and large, those affected by the noise generated by wind turbines live within a few miles of a large wind power plant or within several hundred feet of a small plant or individual turbine. Although the noise at these distances is not great -- a 300-kilowatt (kW) turbine typically produces less noise at 400 feet than does light traffic 100 feet away -- it nevertheless is sufficient to be heard indoors and may be especially disturbing in the middle of the night when traffic and household sounds are diminished. In a similar vein, the American Wind Energy Association's fact sheet on noise notes that "Today, an operating wind farm at a distance of 750 to 1,000 feet is no noisier than a kitchen refrigerator." Which raises a question: how many of us sleep in the kitchen? The sound output levels of today's 1.5 to 3 megawatt wind turbines are rated by their manufacturers, and they consistently range from 98-104dB, about the same as a chain saw, loud stereo, or the sound level inside a subway train. Of course, the sound is less sharp or immersive than these sources, but this gives you an idea. The bottom line is that most modern industrial wind turbines are designed to keep noise levels at or below 45dB at 350 meters (1150 feet), which should drop to 35-40dB at 1000m (commercial turbines are quite often built this close to homes). The sound of the wind off the blades is the primary source of the noise. However, as is noted below, atmospheric conditions can wreak havoc with nice clean sound propagation models, especially at night. And, as turbines get bigger, their noise can be deceptively hard to predict; certainly, they can be quieter at their bases than some distance away, and temperature inversions, wind layers, and other atmospheric effects can lead to surprisingly distant sound impacts. Two examples of a "Wind Rose"
These diagrams chart the wind patterns at a given turbine location, based on prevailing wind speed from various directions. Most turbines will have an "upwind" side where little sound propogates. It is important to recognize that night-time ambient noise levels in rural areas are often 30dB or lower; so, it is not that hard for wind farms to become a new and dominant acoustic presence. All too often, wind developers tell local planning boards that the turbines will be inaudible, which is rarely the case. Similarly, some investigations of noise complaints come to the conclusion that anomalously high noise levels occur so infrequently that they are insignificant (a recent UK investigation of Amplitude Modulation found that it was only an issue 5-15% of the time). But if temperature inversions or other atmospheric stability effects that cause excessive noise occur just 10% of the nights, that means that nearby residents may find their sleep disturbed 35 nights a year. Is this insignificant? Such questions need to be considered directly, not shunted aside. 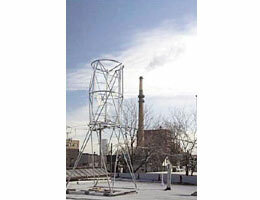 Interestingly, smaller backyard turbines are often noisier than large industrial turbines. This is due to faster blade rotational speeds, and the fact that industry and government money is being devoted to making industrial turbines quieter. And of course, backyard turbines tend to be much closer to residences than industrial machines, making their noise more constant. On the positive side, many new nearly-silent designs are becoming available for small turbines; see the pictures and links at the bottom of the page. It is sometimes noted that large wind turbines are getting quieter. This is clearly true for the mechanical noise emitted by motors and gears, which have seen noise-reduction design changes including soundproofing of turbine boxes, gears that flex, and sound-dampening to limit vibrations being passed to the tower and ground. While overall noise levels per unit of energy output are dropping, today's turbines are far larger than older ones, so total noise output is not necessarily decreasing, and is now mostly generated by the sound of the turbine arms swinging through huge arcs in the air. Design of turbine blades is of course continually being improved; after all, the noise is a sign of inefficiency (rotational energy sacrificed by aerodynamic turbulence), so newer blades are likely to be quieter. While in many situations, the sound from turbines is drowned out by nearby wind noise, or is perceived as a gentle whooshing noise that is quite easy to accommodate, in some wind or atmospheric conditions, a pulsing noise can arise, which is much harder to ignore or acclimate to, making it a major source of complaints. Perceptually, the problem is that any pulsed or irregular sound (this rhythmic thumping can wax and wane over the course of a night) will tend to cause more disturbance. It also seems that these sounds travel farther in calm night air; one widely-respected study (van den Berg, see below) found that sound levels were 5-15dB louder than predicted in some night-time atmospheric conditions, and noted that residents as far as 1.9km away were disturbed by noise. In some cases, the pulses are caused as the blades pass the tower, with maximum noise pulses audible in different areas around the turbine, depending on the wind direction. This has been termed Amplitude Modulation of Aerodynamic Sound, or Aerodynamic Modulation. The physics of this phenomenon are not fully understood. There has been some speculation that modern turbine designs, with the rotors on the upwind side of the tower, should reduce or eliminate the problem, though ongoing reports of such pulsing sounds suggest otherwise. While the United States does not have national noise standards, many European countries do. These countries, and many state or county regulations in the US, typically set an absolute sound level that any industrial facility must meet. Commonly, 45dB is used as the night-time limit, and 55dB as the day time limit; higher thresholds are sometimes allowed, but rarely does the night time limit drop below 40dB. The problem comes in rural areas, where night-time ambient noise (wind, distant traffic, etc.) is often 35dB, and sometimes as low as 25dB. Given that 10dB is perceived as twice as loud, the problem is obvious. It should be noted that the majority of wind farms do not trigger noise complaints. These are likely sited far enough away to work well for nearby residents. A 2007 report from the UK found that roughly 20% of wind farms (27 of 133) had received complaints about noise (researchers report that about half of these were primarily visual complaints, with noise a secondary issue). While noise modeling (predicting the noise levels around wind turbines) tends to indicate that noise impacts should be insignificant beyond several hundred meters, the French National Academy of Medicine has called for a halt of all large-scale wind development within 1.5 kilometers (roughly 1 mile) of any residence, and the U.K. Noise Association recommends a 1km separation distance. In the US, there is no overall recommendation; siting decisions are made locally, and often are based on a 45dB night-time noise limit, so that turbines are sited no closer than 350m (roughly 1100 feet); 350-700m is often considered a reasonable setback in the US, based on simple sound propagation modeling. Though it is also common for larger set-backs to be used, 1000m (1km/3300 feet) or 1500m (roughly a mile) setbacks are virtually never required. A particularly vexing aspect of trying to regulate wind farm siting to assure that neighbors will not be subject to undue noise impacts is the well-known wide variation in individual perception and response to any given noise level or noise source. Not only are is there a wide variation in simple acoustic perception (i.e., how well people hear), but some people are more apt to be annoyed by sounds than others. Industry spokespeople too often claim that anyone complaining about noise is actually using sound as a ready excuse for their general opposition to a local wind farm; in fact, there is a substantial body of research that explores the individual variation in response to similar sounds, and this variation is reflected in surveys of people living near wind farms. Of course, a key factor in whether a sound is annoying is one's attitude toward that sound; your own loud music is far less apt to bother you than your neighbor's quieter stereo wafting in on the breeze. But again, this is not the whole story: there is an inherent variation in sensitivity to and annoyance in response to noise. Those who are bothered by noise are likely to experience a wide variety of responses, including sleep disturbance, annoyance, and stress. Surveys around wind farms provide some insight into this factor. While results vary somewhat, an overall trend seems clear: while about half the people who can hear wind turbines seem not to be particularly bothered by the noise, a substantial minority (around 25%) are more sensitive to the noise, often reporting serious sleep disturbance. As noise levels rise above 40dB (common at a quarter to half mile), annoyance rises substantially; at sound levels of 30-35dB (likely to be heard at a half mile to a mile), far fewer people report severe annoyance or regular sleep disruption. For more detailed consideration of some of these studies, see two posts at AEInews.org: Wisconsin survey, summary of three European surveys. 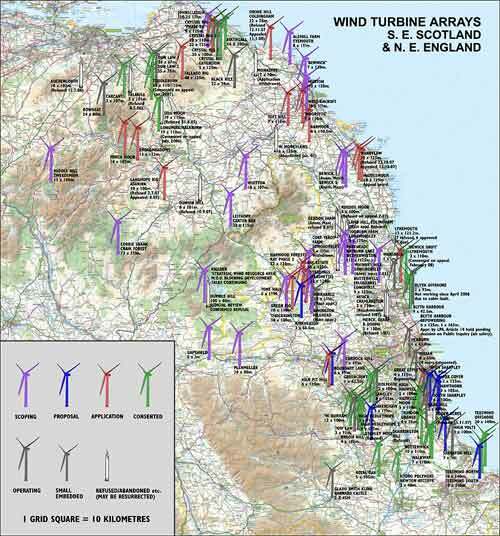 Many of those being bothered by noise were not opposed to their local wind farm when it was proposed or built; they simply were not prepared for the degree of disruption that the turbines' noise would cause. Some say that it is primarily turbines within a half mile that are intolerable, and that they could easily live with the noise of those farther away; others say that there are turbines between a half mile and mile could still cause them problems. But in either case, the issue is not looking at turbines—in large wind farms, turbines are easily seen, and seem surprisingly close (visually) at distances out to several miles. There is far more gray than black and white in the surveys made around wind farms. Still, they provide a concrete picture of annoyance and sleep deprivation increasing as turbine noise increases, along with a better sense of the proportion of affected neighbors who will experience these impacts at various distances and received sound levels. Clearly, 35-45dB is a range at which impacts on neighbors become far more widespread. The social question that will need to be addressed is what proportion of nearby neighbors we will accept causing sleep deprivation or annoyance in: 10%? 20%? Where will we draw the line, beyond which we consider turbine placement too close? In some cases, low-frequency noise can become an issue with wind turbines. These sounds may be inaudible to the human ear, yet still be perceptible as a vibration, especially inside houses. Such low-frequency noise could be transmitted through the ground from towers, or be a component of a broadband noise field generated by spinning turbine blades. Low-frequency noise travels greater distances with less loss of intensity than higher-frequency sound. It is important to measure the noise from turbines using a db(C) scale, which is weighted to accentuate low-frequency components of a broadband sound field. Most noise standards are weighted to the dB(A) scale, which accentuates frequencies heard best by the human ear. It is becoming a standard procedure in dealing with industrial and machine noise to compare db(C) and dB(A) readings; when dB(C) is 20dB more than dB(A), or when dB(C) is 60dB or higher, it is considered an indicator that low-frequency noise is at problematic levels, and the need for special low-frequency mitigation is then generally called for. An area of increased controversy in the past year has been the question of whether low-frequency (infrasonic) noise from wind farms can cause physiological responses in nearby neighbors. Some wind farm neighbors report uncomfortable pressure or pulsing in their heads or ears, dizzyness, and similar feelings, and a 2009 publication, Wind Turbine Syndrome, has triggered intense reactions on all sides of the issue. The book reports on what is likely the worst-case scenarios of health impacts among wind turbine neighbors, compiled to make the case for further study of the issue, and postulates that the issue is low-frequency noise triggering a reaction in the vestibular (inner ear/balance) system. Acousticians who have studied physiological responses to low-frequency noise claim it takes much higher exposure levels (e.g. as experienced in factories or inside spacecraft) to trigger any health problems, while a steady trickle of reports from around the world from people near wind farms continue to fuel concerns. It is important for all concerned to not get overly caught up in the controversy over low-frequency noise; all too often, far more straightforward audible noise concerns are discounted with a sweep of the hand in response to low-frequency reports that are far harder to substantiate. Likewise, fears about low-frequency noise impacts are often at the center of pre-construction local resistance efforts, despite the fact that these problems appear to be much more rare and unpredictable than audible noise issues. As mentioned above, individual variation in sensitivity and audibility of noise is a key factor; these variations are even more pronounced with low-frequency noise, with a very wide range of individual responses. It is likely that those who report vibrations and strange feelings are the most sensitive people; it is also very possible that many of the symptoms reported are primarily caused by loss of sleep, rather than direct impact of low-frequency sound waves. Many people in recent months have expressed concern about the health effects of wind farm noise, but it is quite likely that most of the symptoms reported (irritability, increased blood pressure, headaches, poor concentration, etc.) are, in most cases, largely secondary effects of sleep disruption, rather than being directly caused by noise exposure or sound waves acting on the body. A recent paper by sleep disturbance expert Dr. Christopher Hanning (not an academic paper, but an informal paper written in support of a community group) offers a good lay summary of what is known about sleep disruption by moderate noise levels. Hanning’s primary point is that external noise need not wake a sleeper to cause problems, and that repeated “arousals” can break the most restful periods of sleep. He notes that “The sleep, because it is broken, is unrefreshing, resulting in sleepiness, fatigue, headaches and poor memory and concentration.” These are precisely the symptoms often reported by people living near wind farms. He stresses that arousals are also associated with “physiological changes, an increase in heart rate and blood pressure, which are thought to be responsible for the increase in cardiovascular risk. Arousals occur naturally during sleep and increase with age (Boselli 1998) which may make the elderly more vulnerable to wind turbine noise. Arousals may be caused by sound events as low as 32 dBA and awakenings with events of 42dBA (Muzet and Miedema 2005), well within the measured noise levels of current wind farms” and the levels permitted by most jurisdictions. Small town governing bodies are generally ill-equipped to address the questions before them when wind energy companies apply for local permits. In many cases, the proposed wind farm is the first outside industrial facility to be proposed in the town; it is almost always the first 24/7 noise source to appear in the local rural landscape and soundscape. Energy company experts attend town council or selectmen meetings, often submitting comprehensive documentation that is rarely fully comprehensible to the lay members of the town's governing body. While these documents don't generally promise anything quieter than 45dB, the outside experts too often assure local officials that the wind farms will be inaudible--relying on flawed assumptions that high winds will always create enough increase in ambient noise to drown out the turbines. The use of comparisons, such as "a kitchen refrigerator" or "traffic 100 yards away" is likewise a common way of reassuring locals--one such expert went so far as to assure a council that the 45dB drone of turbine noise was "comparable to" bird song on a summer afternoon! "There are no rules and regulations on windmills," Paul Cheverie, chairman of the Eastern Kings Community Council (Prince Edward Island, Canada) said. "The more we get into it, the more we realize we jumped the gun." Complaints from wind farm neighbors about noise are often discounted as the griping of a tiny but very vocal minority. Are we simply hearing from the most sensitive or the most crotchety people? A recent research paper suggests not. Christopher Bajdek’s paper focused on creating realistic expectations about noise (and in so doing, countered both over-reactions of some websites and overly sanguine projections by industry reps). Presented at NOISECON 2007, a noise control industry conference, it included two key maps that charted dB measurements and the percentage of residents who were “highly annoyed” by the noise: 44-50% of people under a half mile away were "highly annoyed" (over a third within a half mile had been awakened by turbine noise); only as sound levels drop below 40dB do annoyance levels drop substantially; as sound drops below 35dB (a bit under a mile from nearest turbines), annoyance drops to 4% and less. Bajdek noted higher annoyance responses to wind farms than to other similarly loud industrial noises, such as roads and railroads, with the supposition that visual impacts elevate reported annoyance. However, that cannot account for the many people awakened by the noise; the irregularity of turbine noise may be a more important factor in making wind farms more annoying than other industrial sounds. Problems began within weeks after the turbines started operating. Downwind from the turbines, when the air was moving just enough to turn them, (12-15 knots from the northeast), the noise was loud. It was a repetitive modulated drone of sound. Dwayne Bailey and his father Kevin both claimed it sometimes was loud enough to rattle the windows of their homes on the family farmstead. The sound was even worse in the field behind their homes. Distances from 1 to 1.5 kilometers were the areas of the most annoying sounds. This spring the winds created constant misery. "My idea of noise is a horn blowing or a tractor - it disappears," said Sheila Bailey. "This doesn't disappear. Your ears ring. That goes on continuously." Dwayne developed headaches, popping and ringing ears, and could not sleep. He tried new glasses, prescription sleep aids and earplugs, to no avail. Dwayne’s two year old was sleeping well prior to the wind farm, but began waking up, 5- 6 times a night. Kevin Bailey stated, “When you are outside working and absorbed in what you are doing, you are OK. If inside, resting or reading, it’s a problem. Forget about sleeping at night. The repetitions would go away, you think that it is gone, and it comes back again.” Kevin tried sound dampening by draping the front walls inside his house, and sleeping in the back, but this did not work. Aspects of their experience (including vibrating appliances) suggest low-frequency noise may have been a key factor here. Life for the d'Entremont family since the Pubnico Point windfarm began operating has been filled with sorrow, illness, heartache and disbelief. How could a company be permitted to enter our community and turn our pristine area into a noise ravaged battleground. Why did it happen to us? Not that we would wish it on anyone else. The first 2 turbines were operating in May 2004. One was 4000ft from our home, the second 4700ft. A 120 day trial period was required to monitor their productivity. We could hear them well and Carolyn, my wife was experiencing ringing in her ears. Visitors would comment that the one 4000ft away seemed really close. Some neighbors were complaining they were bothered by them at night. Three months later construction began again. It was easy to tolerate the noise and construction dust because we knew it was only temporary. 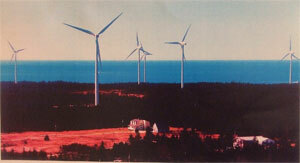 February, 2005 the windfarm was fully operational, 17 wind turbines. The windmill 4000ft away seemed far off compared to the one 1000ft from our home. They are loud. They’ve been compared to jet engines. A plane that will not take off. There is no gentle swoosh, it is a whoosh noise. They grind, they bang, they creek. The noise is like surround sound, it’s omni-directional. It feels like there's this evil thing hovering above you and it follows you everywhere, it will not leave you alone. This noise will not allow you to have your own thoughts, the body cannot adapt, it’s a violation of your body. It is a noise that the human body cannot adapt to even after more than a year of exposure. As time progresses the noise becomes even more unbearable. Our 5 year old son Elias was afraid and unable to sleep in his own bed for more than one year. He would get in our bed or in his brother's bed. We would put him to bed at 8:30 and many nights at 11:00 he would still be awake. Finally he would fall asleep wrapped up in the blankets in the fetal position with his head covered and with a fan at his head. We had to create more noise to mitigate the windfarm noise. The body can adapt to the fan noise. In the morning he would get up tired and cranky. In September 2005 he started school and he was not getting enough rest. He began getting more and more aggressive with his friends. He was very defiant. We knew he was suffering terribly. He’s had throat infections and often had a fever and not feeling well. We abandoned our home February 21st, 2006. Since the move Elias has been doing much better. He sleeps in his own bed every night. He sleeps partially covered with his arms and legs spread everywhere. It was only ten days after the move while he was having his back rubbed in bed he said “it’s nice to be able to go to bed and sleep". He is much less defiant. He has become the kind gentle little boy he was before the windfarm nearly destroyed his life. Local resident Phil Bloomstein used a sound meter to record decibel levels at his home. The results, which Bloomstein captures on a laptop, show a mean sound level of over 52 decibels, never dropping below 48 and peaking at 59 decibels. "When the turbines were being proposed to be put up," he says, "we were told that 45 decibels would be as loud as it would get except for ... no more than eight days a year." Neighbor Jeff Keating, a bit further from the closest turbine, said, to date, the noise has woken him up three times at night. He likened the experience to hearing the furnace kick on, then lying awake mad about having been woken. "It's not just a physical thing," he said, "there's an emotional side." Keating's neighbor Steve Bennett said he hears the turbines at all times of day. "It's like a jet plane flying overhead that just stays there," he said. From a distance, the jet plane analogy fits the sound produced by the turbines - a white noise suggestive of a plane that never entirely passes. Closer to the turbines the sound quality changes. 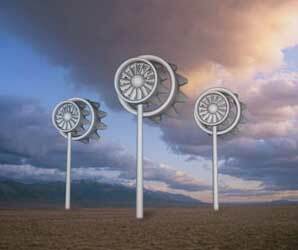 Each turbine rotates to face the wind and the sound varies in relation to one's orientation to the blades. At close range, facing the turbine head on, the sound is low and pulsing like a clothes dryer. From the side the blades cut the air with a sipping sound. Either way, when the wind is blowing, there is noise. "They simply do not belong this close to people's homes," Bennett said. "Our property values have been diminished, and our quality of life has been diminished." Julian and Jane Davis spent 60 nights away from home in the first six months of the wind farm's operation, due to lack of sleep, then moved out permanently at the end of 2006. Mrs. Davis says, "It sounds like a train coming toward you that never arrives, or a toy stuck in a tumble drier." They blame Amplitude Modulation as the issue; the local South Holland District Council recorded the noise, but reported that "the noise does not equate to statutory nuisance at this time." Update: In spring 2008, they attempted to put it on the market, but local real estate agents refused to list the property due to the noise. Russell Gregory wrote to Mr and Mrs Davis saying until the problems with wind turbines were resolved it was impossible to put a current market value on the property as no prospective buyer would want to live there and no mortgage lender would be prepared to lend on it. He said: "I don't think I have ever refused one before. We have a duty towards the buyer but if you can't sleep there then it is uninhabitable." A two-year old wind farm was stirring new noise complaints. One noise study put the sound below the township limit of 45dB, but residents claim their readings are higher. 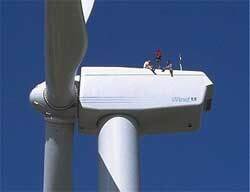 Tape on the trailing edge of turbine blades had come lose, and was causing much of the excess noise; a new owner is doing repairs, starting with turbines closest to homes. Resident Jill Stull (turbines 2000ft/600m from her house) said, ‘‘You know when you're standing outside and you hear a plane coming about 30,000 feet overhead, then it goes off in the distance? It sounds like those planes are 5,000 feet above your house and circling and never land." The Stulls said they could move, but they aren't going to. ‘‘We're not going anywhere. I just want them to be quiet. I'm not going to jump on the ‘I hate windmills' bandwagon because I don't," Jill Stull said. ‘‘I'm just tired of nobody listening. My point is what is your peace of mind worth? I can't play outside with my kids back at the pond in the woods because it gives me a headache." "I know it's going to make some noise, but a lot of times, it sounds like a jet," resident Myrle Baum said. "On a calm day, you come outside and try to enjoy a nice peaceful day, and all you hear is the noise all the time and you can't get away from it," said Bob Castel, who has two turbines behind his house. "The first time they started them up, I didn't know what it was. I was like man, that's a weird noise. It was that loud." said Castel. While some neighbors said they aren't exactly bothered by the noise from the windmills, they said there's never peace and quiet either. "You notice them more at night, but you can't really hear them inside," said Charles Holland. April 16: From 6PM to 10PM the turbines were loud. I could hear #'s 4, 73, and 74a. Jet sound or like waiting for two trains to crash. We house a 360 (cubic inch) sprint car at our house. Tonight it was run for the first time this year. One of the guys mentioned he could hear the turbine (#4) over the sound of the race car engine while it idled. He was standing between the tire and the engine or right next to the engine. The car has no muffler. During the day the wind is strong. The weather man says the wind will be 25-35 miles per hour. So strong that I don't hear the turbines very much. Earlier my wife said she worked outside all afternoon in the wind and her ears were fine. When the wind died down and could hear three of the turbines her ears hurt. She also mentioned the whooshes between turbines were out of sync. April 12: At breakfast asked (my son) if he could hear the turbines in the house. "Yes, and I hear them in my room", he said. "Some nights I can't sleep". His room is upstairs on the SW corner of the house. As I sit below his room (inside the house) I can hear the turbine at this moment. 9:30PM #4 not running, however I can hear the jet sound of #6. Two farmers I have talked to are really angry about how they were treated. That is, once the contract was signed it meant the contractors could go where ever they wanted to on the farmer's land. One also had issues as to the placement of the tower road, he wanted it on the fence line or to take out the fence line to minimize land loss. He was told it would cost too much to re-survey the land. The farmers said they were not told about the interduct or collection system that would be going through their land. Any complaints made to (the wind developer) was met with "it's in your contract." Ernest Marshall moved from his home of thirty years, driven out by the noise of a wind turbine built two years ago, which scares his ponies and purrs incessantly through his bedroom window, keeping the Marshalls from a good night's sleep. Marshall suffered a stroke not long after the new the turbine began operation and, on the advice of his neurologists, has sold his home and is moving. "I'm a nervous wreck," Marshall, 65, said. "We've got to leave ... You can't know how it affects your nerves." Marshall is quick to clarify he's not against what it stands 80 metres high for -- clean energy. "The problem is they're putting them too close to people." "It's like someone swinging a rope over your head," says Gentry County horse breeder Charlie Porter of the several wind turbines within about 2,000 feet of his home near King City. "It's not really a loud noise. It's just a constant noise." Porter, 53, claims the 260-foot turbines installed by St. Louis-based Wind Capital Group near his 20-acre spread have been making his family sick since they started rolling last year. Their symptoms include sleeplessness, anxiety and dizziness. "It's immediate," he says. "If they're running, you're miserable. If they're not you can try to stay outside and enjoy it all you can. It's like a day off." Ron Williams, 73, reports: "The swush, swush, swush as each blade breaks the flow of the wind past the tower, obviously three times per revolution, is extremely debilitating. The affect is worse at nights when ambient noise level from traffic on the A595 is low." Mr. Williams said that wind farm operators claimed that turbine noise levels were within legal limits but he questioned whether the effects of this low frequency noise had been thoroughly investigated. 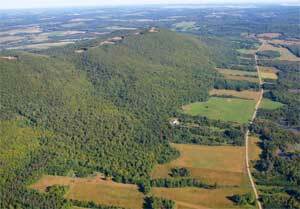 Disturbance from noise is undoubtedly subjective: After recently visiting Mars Hill, Richard Jennings of Fayette said he did not see the wind turbines there as ugly or bad. His visit brought him to a home 3,000 feet from seven of the turbines and the noise was no worse than his sleep apnea machine at night. He urged the board to accept a proposed 44-turbine wind farm in Kibby Township because alternative energy is a necessity. Unfortunately for us, the very mountain that has provided the wind facility with a class 3-wind resource often acts like a fence protecting us from the upper level winds that push the turbines. There are many times when winds are high on the ridgeline but are near calm at our homes. The noise and vibrations from the turbines penetrate our homes. At times there is no escape from it. It doesn’t matter which room you go to, there is no escape from the noise. The noise ranges from the sound of a high range jet to a fleet of planes that are approaching but never arrive. When it’s really bad it takes on a repetitive, pulsating, thumping noise that can go on for hours or even days. It has been described as a freight train that never arrives, sneakers in a dryer, a washing machine agitating, a giant heartbeat, a submariner describes it as a large ship passing overhead. 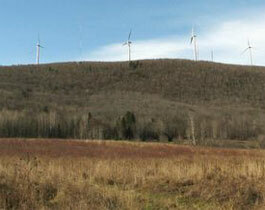 Two views of the Mars Hill wind farm, showing proximity of rural landowners. It is not hard to imagine noise blanketing the fields, especially when the hill is sheltering the lowlands from wind. (Wendy Todd, continued): Visiting a wind facility, or sitting at the end of someone’s driveway once or twice for 2, 3 or even 10 minutes to listen does not make that person an expert on turbine noise. To be an informed witness could take days or weeks for one to know and experience what we are living. Not until an individual has been in a home and has heard turbine noise emissions of 45 decibels or higher does that individual have any right to judge how turbine noise truly affects the lives of people. Even noise experts should be talking to residents who are living next to turbines to ensure they are collecting data that is relevant to the burdensome noise emissions heard by those who live closest to them. Let us tell the sound experts when we are having a noise issue. Nick Archer, our Regional Director with the Maine Department of Environmental Protection thought we were all crazy, too. But he finally made it to our homes and heard what we were talking about. I don’t believe he has ever heard a 50+decibel day but he has heard close to that on more than one occasion and has made statements like these: “This is a problem,” “ We need to figure out what is going on with these things before we go putting anymore of them up,” “I thought you were crazy at first but you are not crazy,” “The quality of life behind the mountain is changed.” Did he say these things just to appease us? I don’t believe so. (Spherical spreading is based on the fact that the total sound energy spreads over an increasingly large sphere as a sound moves outward from its source. Any doubling of distance—whether from 100m to 200m or from 1000m to 2000m—will be marked by a decrease in sound intensity of 6dB, which to our ears, is perceived as cutting the volume almost in half. Higher frequencies are reduced more than this, by atmospheric attenuation, while lower frequencies stay pretty close to this model). In attempt to account for these and other factors, manufacturers often add 2db to their manufacturer's sound emission estimates when applying for permits. A different topographical effect is the one reported at Mars Hill, above, where noise from turbines atop a ridgeline is made "worse" by the fact that the ridge blocks the wind at homes along its foot, eliminating the masking effect that is often assumed to drown out the sound of turbines in high wind conditions. With light and steady breezes capable of spinning the turbines, but not stirring up much ambient noise, sound levels measured at homes a half mile to nearly two miles away are often 5-15dB higher than models would suggest. Making matters worse, this same atmospheric stability tends to allow multiple turbines to settle into a synchronous rhythm (in more turbulent conditions, small differences in wind between the turbines keeps them out of synch). In this case, the "whish" of the blades as they pass the tower often turns into a more annoying rhythmic "thump;" in quantitative terms, the change in sound level creating the whish or thump can rise from 2dB to 5dB or as high as 9dB, making a clearly audible rhythmic pattern. These rhythmic pulses are likely the strongest factor in annoyance. Possible solutions: It is hard to escape the implication that setback distances may need to be increased in many places where the prevalence of such night time effects suggest sound will often remain at annoying levels for larger distances. It could also help to monitor for synchronous blade patterns and add random variations at night, to mimic the random variations that atmospheric turbulence causes in the daytime. Finally, noise modeling studies should include calculations based on night time stable atmospheres; G.P. van den Berg, whose 2006 Ph.D. thesis is a comprehensive study of these effects, concludes that "With current knowledge, the effects of stability on the wind profile over flat ground can be modelled satisfactorily." (his measurements indicate that more sophisticated sound models were accurate to within 1.5dB) He goes on to note: "In mountainous areas terrain induced changes on the wind profile influence the stability-related changes and the outcome is less easily predicted: such terrain can weaken as well as amplify the effect of atmospheric stability." While the quantitative effect of inversion layers on sound levels has not been systematically studied, many opportunistic measurements suggest the obvious: that when an inversion layer forms above the height of turbines, it can facilitate longer-range sound transmission by reflecting some of the sound back toward the ground, or by forming (with the ground) a channel for sound propagation. In many locations, this will be a relatively rare occurrence, but in areas with frequent inversion layer formation, it should be considered. As noted briefly in the introduction, it appears that a common source of noise complaints by nearby residents is a repeating "thumping" noise, rather than the constant whir of the blades. 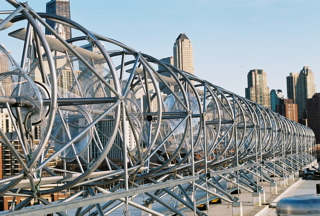 The physics of this phenomenon are not fully understood; it has long been assumed that this thumping is the result of a slight pressure differential caused by the tower of the turbine: as each blade passes the tower at the bottom of its arc, it passes through this lower-pressure region and creates the thumping sound. Depending on the wind direction, this sound is loudest in different directions at different times. 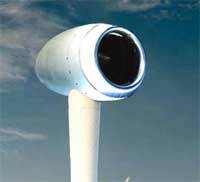 There has been some speculation that modern turbine designs, with the rotors on the upwind side of the tower, should reduce or eliminate the problem, though ongoing reports of such pulsing sounds suggest otherwise. A group of turbines can, at times, turn in synch with each other, causing any Amplitude Modulation to be accentuated, especially at locations equidistant from any two or more turbines. 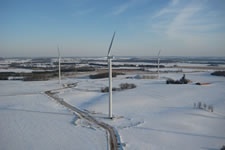 Icing on the leading edge of blades can cause a 3-5dB increase in the source level of noise from the turbine. "There is much more to discover: indeed, it looks like wind turbines have become more fascinating now their sound has proved to be more complex than a simple constant noise from the sky, driven only by wind with a constant profile. This may motivate researchers and consultants to put more effort in better predictions of wind turbine noise, and considering again noise exposure to local residents. "Several technical possibilities to minimize the noise have been outlined in this book, but we need not just depend on technical solutions. A change in public relations can also make a difference: proponents must accept that wind turbine noise is not (always) ‘benign’, that the noise may affect people, and that people who are complaining are not always just a nuisance. And no, we still do not understand wind turbine noise emission entirely, so proponents should watch their WARYDU (we are right, you don't understand) attitude. " Likewise, a 2007 report commissioned by the UK government to investigate noise complaints noted that "‘Unrealistic expectations’ was thought to be a factor in at least one case, i.e. the complainant believed that the noise would be less noticeable than it actually proved to be. In this case the local authority considered that the complaint could possibly have been avoided by more accurate information from the developer at the planning stage....Finally, for five of the sites having received complaints, the site met planning conditions. We do not know whether these comments indicate that complaints were unjustified, or alternatively that planning conditions were too lenient." Indeed, official noise standards can very easily fail to protect nearby residents from disruptive levels of noise. It is crucial that everyone involved (industry, government, residents) resists the easy temptation of relying on "paper" assurances that wind turbines will not create acoustic impacts. Working from a realistic foundation, siting and permitting decisions can proceed in a manner that protects both local residents and the long-term potential for wind energy generation. The map at left shows both the area around Lee, Illinois, and was created by FPL Energy, LLC, in the early phases of a proposed wind energy development which was not built. 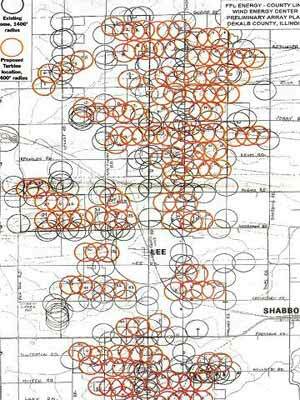 The black circles represent a 1400 foot radius around each existing houses (the distance local laws require wind turbines local to be kept away from a residence). The brown circles represent the proposed site of a wind turbine, each with its 1,400 foot radius. It is remarkable to see the degree to which the 1400 foot setback was pushed to its limits in this preliminary map; throughout the entire wind farm, we see turbines sited at the very edge of the 1400-foot house circles, with the 1400-foot turbine circles extending deep into the house zones, nearly to the center (the house itself). Pushing setbacks to the limit, as here, is bound to maximize the potential for noise issues, especially at home surrounded by nearby turbines. The above sections draw on several detailed reports by others. Those wishing to learn more, or to inform themselves so as to discuss these issues in depth with regulatory authorities, company representatives, acousticians, or neighbors, will benefit from reading the source material below. While there are legitimate noise concerns associated with current wind energy development, this is a vibrant and ever-growing field, and several emerging technologies offer promise of making significant reductions in the acoustic impact of turbine construction and/or operation. 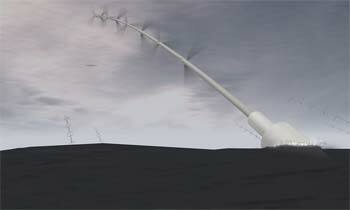 Vertical Axis Turbines - This new approach looks somewhat like a corkscrew, and promises much lower noise impacts. Several companies are developing prototypes and doing initial commercial installations. So far, these designs are sized for home, office building, or apartment building applications. None have been scaled for use in wind-farm settings. While some of these companies brag of higher output thanks to operating at lower wind speeds, others claim that such "drag" designs are inherently more inefficient than traditional "lift" designs. Bear in mind, as well, that while noise on the tips of traditional spinning blades can be an issue, often the mechanical noise of a turbine's "insides" is a large contributor to the noise signature of smaller turbines located close to homes.